Top: Blackberry Gin Fizz (photo courtesy NathanandChristinaMakeFood.com). Here’s the recipe, made with muddled fresh blackberries instead of blackberry brandy. Bottom: Blackberry brandy. Check the back label to be sure it’s made with natural flavors (photo courtesy Leroux). We tend to try new cocktail recipes on weekends. Life’s too short to keep to our three or four standards, much as we love them. We keep a running list of cocktails we’d like to try. Friends and neighbors know that it’s “open house” on late Sunday afternoons: They can stop by and try the weekend’s special. We discovered a bottle of blackberry brandy in the liquor cabinet, so this weekend we’re mixing up a pitcher of Blackberry Gin Fizz: gin, blackberry brandy and Prosecco. A fizz is a type of mixed drink—a variation on the older sour recipe. Sours are a family of mixed drinks that combine alcohol with lemon or lime juice—the sour component—plus a sweetener (fruit juice, grenadine, honey, liqueur, maple syrup, simple syrup, sugar, etc.). Sours are one of the original cocktails described by Jerry Thomas in his 1862 book, How to Mix Drinks. Famous sours include the Daiquiri (rum, lime juice and sugar), Margarita (tequila, cointreau and lime juice), Sidecar (cognac, triple sec and lemon juice) and Whiskey Sour (whiskey, lemon juice and sugar). A sour becomes a fizz with the addition of carbonated water. The first printed reference to a fizz (spelled “fiz”) is in the 1887 edition of Jerry Thomas’ Bartender’s Guide, which contains six “fiz” recipes. Adding carbonated water to a Gin Sour—gin, lemon juice and sugar—creates a Gin Fizz, a.k.a. a Tom Collins). 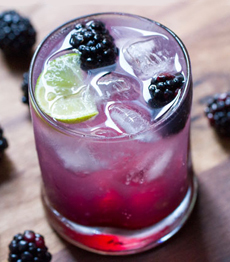 Substituting blackberry brandy or liqueur for the sugar creates a Blackberry Gin Fizz. The Fizz became widely popular in America between 1900 and the 1940s, and spread internationally. Known as a hometown specialty of New Orleans, the Gin Fizz was so popular that bars would need to employ extra bartenders to shake them. This recipe comes from the Salt Creek Grille in Princeton, New Jersey, which used Tanqueray gin. You can make your own blackberry brandy from fresh blackberries and regular brandy (recipe below). If you have extra bottles of brandy, go for it—but note that it takes two months for the fruit to fully infuse. You can use the blackberry brandy to make Blackberry Juleps, Margaritas, Mojitos and other cocktails. 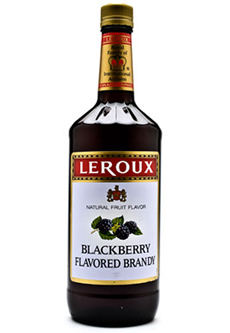 You can also use the blackberry brandy for a variety of other drinks and foods (see below). 1. COMBINE first four ingredients in a shaker with ice. Shake and strain into an ice-filled collins glass. 2. TOP with prosecco. Garnish with a notched berry on the rim, or a cocktail pick with blackberries. Instead of blackberry brandy, use muddled fresh blackberries. For a frozen drink, freeze fresh blackberries and toss them into the blender with the other ingredients. Make a mocktail with club soda, lime juice and blackberry juice (we used Welch’s Farmer’s Pick Blackberry Juice). Make a slush—a Blackberry Sgroppino, adapting the Venetian cocktail made from lemon sorbet, vodka and prosecco. 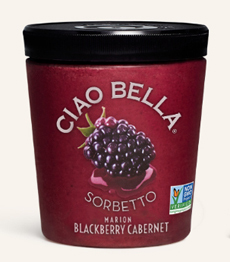 Substitute blackberry sorbet for the lemon sorbet in the recipe above (we use Ciao Bella’s Blackberry Cabernet sorbet). *Liqueurs are sweeter than fruit brandy, and are grain-based (gluten) instead of grape-based (gluten-free). Crémant from France, Woodbridge Brut from California (Robert Mondavi, Domaine Ste Michelle Brut from Oregon. Don’t buy the cheapest brandy on the shelf. What you put in determines what you get out. According to StarkBros, a purveyor of fruit trees, you should wait to add the sugar until the end of the infusing process. 1. DIVIDE the blackberries and sugar among the jars; pour in the brandy. Seal the jars tightly and shake well. 2. STORE the jars in a cool, dark place, shaking every other day for a week. Then shake, once a week for two months or longer. The longer it steeps, the better the brandy will be. 3. WHEN you’re ready to drink it, strain the liquid into a 1 liter bottle (33.8 ounces). For your next batch, you can consider adding another layer of flavor: a whole clove, a strip or two of lemon peel (pith removed) and 1/4 teaspoon vanilla. While many people use these terms interchangeably, and they are all flavored spirits, there are differences in terms of sweetness and color—and in the case of fruit brandy, the base alcohol. Liqueur (lih-CUR, the French pronunciation) is made by steeping fruits in alcohol after the fruit has been fermented; the result is then distilled. Liqueurs are typically sweeter and more syrupy than schnapps. 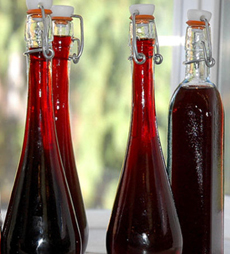 Top: Homemade blackberry brandy (photo courtesy StarkBros.com). Bottom: Make a slush by adding blackberry sorbet (photo courtesy Ciao Bella). Schnapps (SHNOPS) is made by fermenting the fruit, herb or spice along with a base spirit, usually brandy; the product is then distilled. This process creates a stronger, often clear, distilled spirit similar to a lightly flavored vodka. “Schnapps” is German for “snap,” and in this context denotes both a clear brandy distilled from fermented fruits, plus a shot of that spirit. Classic schnapps have no added sugar, and are thus less sweet than liqueur. But note that some manufacturers add sugar to please the palates of American customers. Eau de vie (OH-duh-VEE), French for “water of life,” this is unsweetened fruit brandy—i.e.,schnapps. Cordial has a different meaning in the U.S. than in the U.K., where it is a non-alcoholic, sweet, syrupy drink. In the U.S, a cordial is a sweet, syrupy, alcoholic beverage: liqueur. In sum: If you want a less sweet, clear spirit, choose schnapps/eau de vie over liqueur. For something sweet and syrupy, go for a liqueur or cordial. Liqueur is sweeter, and typically made from a grain-based alcohol. Fruit-flavored brandy is made from a grape-based alcohol. Be sure to buy one that is all natural, i.e., made with real fruit instead of flavored syrup. With a quality brand, the fruit is macerated in the alcohol, then filtered out prior to bottling. There are a few Cognacs-based liqueurs such as Chambord (raspberry), Domaine De Canton (ginger) and Grand Marnier (orange). Cognac is a higher-quality brandy made according to the stringent standards of the Cognac commune of southwestern France. Drink it straight as an apéritif. Make a spritzer with sparkling water or sparkling wine. Make blackberry granita, ice cream or sorbet. Use as a flavoring in desserts. Use as a dessert sauce to top angel or pound cake, ice cream, sorbet, etc. Use to make sauces for savory dishes, such as duck and salmon.